The European Congress of Radiology is currently being held in Vienna where 20,000 delegates are enjoying the opportunity to visit the beautiful city on the Danube. Following its introduction in 2013, the organizers have again set up live streaming video of more than 1,500 presentations between 2 and 6 March 2016. Anyone located anywhere in the world, with access to the Internet and decent bandwidth can view these presentations in real-time from the comfort of their own armchair. Registration is free and can be completed in a few easy steps by clicking here. Most presentations are archived for later viewing. Yesterday saw a session on the common mistakes that can be made when imaging the breast. As summarized by Rebekah Moan in ECR Today, these mistakes are not only made in mammography, but also in second-look ultrasound and even in magnetic resonance imaging (MRI). The mistakes may be broadly defined as errors of interpretation and can be influenced by the type of tumour, the density of the breast tissue, the imaging technology being applied, and the skills of the radiologist. Earlier today there was a special session entitled “Mammography in Nordic countries: screening and new developments” in which five speakers from Denmark, Iceland, Sweden, Norway and Finland presented a range of papers. The topics varied from implementing a mammography screening programme, to assessing the risk for cancer in dense breasts, to interval cancers and, finally, new developments in MRI. Their findings and recommendations may be found in a summary report by Frances Rylands-Monk. Another session today focused on women’s health imaging, in particular advances that have been made in screening and diagnostic procedures. 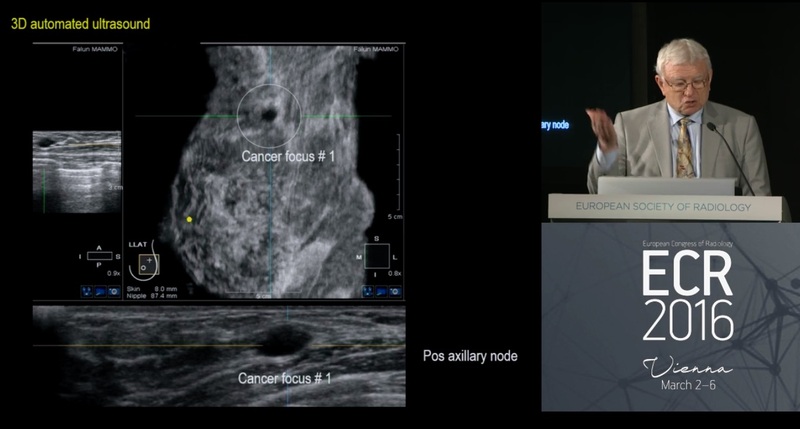 Pierpaolo Pattacini from Italy spoke about digital breast tomosynthesis compared to mammography, while László Tabar of Sweden (seen at left) described how 3D automated breast ultrasound (ABUS), when combined with full-field digital mammography (FFDM) is the responsible approach for screening women with dense breasts. The problem, of course, is workflow and that’s where CapeRay’s dual-modality Aceso system could make a significant contribution. When we wrote three years ago about ECR streaming live, Professor David Dent of the University of Cape Town commented: “A virtual conference in Vienna has advantages. It also has the major disadvantages of not eating a slice of chocolate cake with 6 different layers at Demel; of not seeing that vast collection of paintings by Bruegel; of not going to the Staatsoper on an opening night.” I’m sure we can all agree with that sentiment!